Povidone iodine is included in the product. “Povidone iodine” is a very safe disinfectant which is widely used in eye drops and disinfectants for ophthalmic operations. Simple care requires only setting the contact lenses in the storage case and putting a neutralization tablet and liquid agent in the case. Visual check of completed disinfectio promotes correct and easy daily care performance for everyone. O2 SEPT® can be used safely because the compatibility test for orthokeratology lenses* has been conducted. Before handling contact lenses, be sure to wash hands thoroughly with soap. Use this product at room temperature. 1.Place contact lenses in the storage case, put a neutralization tablet in it, and fill the case up to nine-tenths with the liquid agent. * If a neutralization tablet is not put in the case, the contact lenses might become discolored. * Be sure to use a cross type case. 2.Close the lid and soak the lenses for at least 4 hours. 3.Rinse the contact lenses thoroughly with rinsing solution while in the case before wearing. For long-term storage of contact lens (one week or longer). 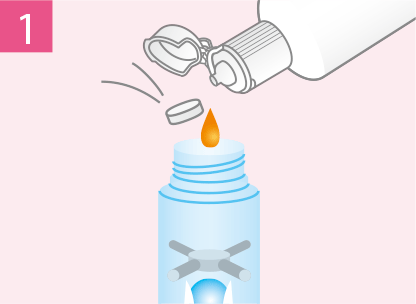 Care for contact lenses using O2 SEPT® according to usage, and store the case at room temperature with the lid closed. 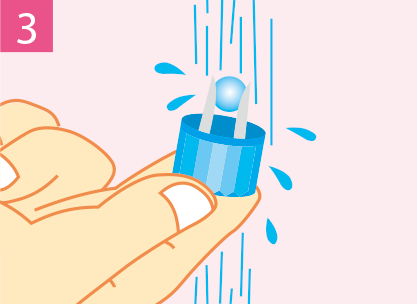 Rinse the contact lenses thoroughly with rinsing solution while in the case before wearing them. 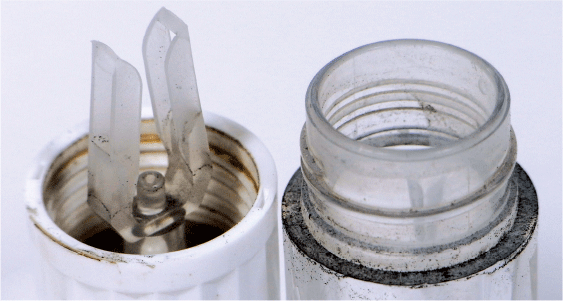 * Avoid storage of contact lenses in the storage case containing only liquid agent for O2 SEPT®. 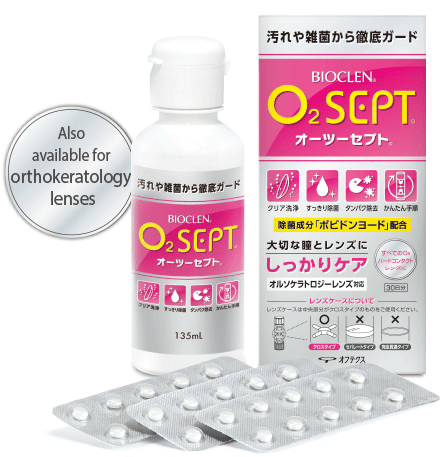 * If contact lenses are to be stored for a month or more, care for them at least once a month using O2 SEPT®. As the deposition level of contact lenses varies for every wearer, deposits cannot be completely removed in some cases. 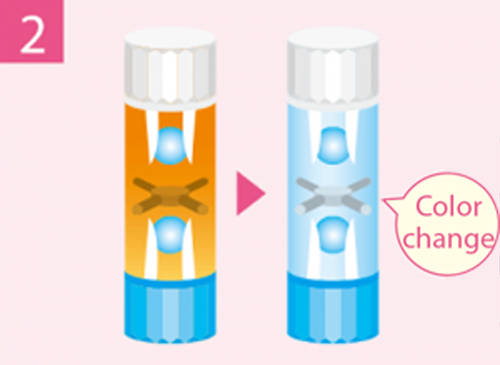 If deposition is severe, use the protein and lipid deposits removing agent separately. * After such care agents have been used, rinse the contact lenses thoroughly with rinsing solution to wash these agents completely off the lenses. If the ingredients of the care agents remain on the lenses, the disinfecting effect and cleaning effect of this product may be reduced, or characteristics of the lenses may be changed. After use, wash the lens case thoroughly with rinsing solution, and let the lid and the body of the case dry naturally and separately. Be sure to use the cross type lens case in which a neutralization tablet can be retained at the center. 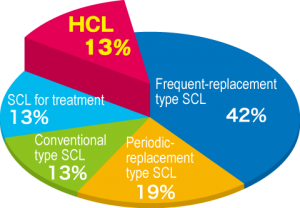 Avoid using the separate type lens case with a partition (double-cell structure) or the full penetration type lens case in which a neutralization tablet cannot be retained. 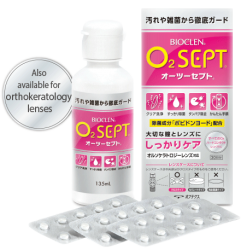 For orthokeratology lenses, please use O2 SEPT with their specified lens cases. Why is “Disinfection”required for RGP lenses? Even users of hard contact lenses can develop infections. In recent years, infections in users of contact lenses have been acknowledged as a problem, and even people wearing hard contact lenses are known to develop infections. As for hard contact lenses, however, disinfection is not required and use of tap water is also permitted. The lens case for RGP lenses is apt to be used for a long time, and the shape may be complicated. Hence, bacteria in the case feed on contaminants such as protein deposits and thus proliferate. In addition, bacteria adhering to the case are disinfectant resistant, and may transfer to contact lenses, causing ocular infections. Why is “Disinfection”required for hard contact lenses? We propose a care solution involving disinfection plus cleaning for O2 / hard contact lenses! 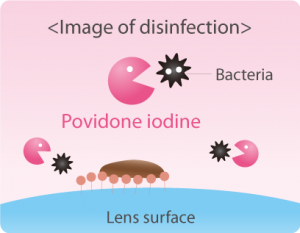 O2 SEPT includes a disinfectant, povidone iodine which penetrates the biofilm made of bacteria adhering to the case, and can effectively eliminate the bacteria which cause infection. with proteolytic enzyme at each use of contact lenses. 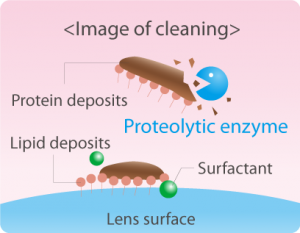 Proteolytic enzyme and surfactant contained in O2 SEPT® effectively remove deposits comprised of protein and lipids adhering to lenses. O2 SEPT® is also suitable for orthokeratology lenses with complicated shapes. Copyright © 2015 Ophtecs Corporation All Rights Reserved.